 Response from the Chairman. I give the floor to the national leadership to comment on what had been said by Cdr. Salva Kiir, I don’t want this to be a debate between Cdr. Salva Kiir and I.  Edward Lino thanked the Chairman and said we are really in need of resolving the problems within the SPLM/A. The people of Abyei are accused of being Dr. John’s supporters and as such, are victimized for that. Cdr. Pieng made an intervention that Cdr. Edward was not addressing the issues.  Cdr. Elijah Malok stated he really supported what Cdr. Salva Kiir said, and recommended that a collective leadership be created. Here in Bahr El Ghazal Cdr. Deng Alor has been away for too long and these are known facts; the leadership council should address and resolve these outstanding issues and go back on the right track. Let us form committees to reorganize the army, since all the units are here. I don’t believe what Cdr. Mayardit said about the people being victimized. Structures are to be recognized right way as a government so let us reorganize them and work in the right way as a government.  Dr. Justin Yac. I will go with the suggestion of Cdr. Pieng that the Chairman response to the issues raised by Cdr. Salva Kiir.  Cdr./Dr. John Garang I will give my contribution to what has been raised; that firstly we need to dispose of rumours. In the whole of South Sudan, there is a general concern from the citizens, and in Yei, the officers and citizens believe there is a danger facing the Movement. We have to clear the danger and give our people assurances.  Cdr. Deng Monydit. Greeted everyone and praised the leaders for coming together. He stated his appreciation of the response given by the leadership; ‘I want to say I am happy to discuss what was about to be stolen from us, and it is not the concern of those in London. This struggle is not the private property of anybody. Whoever says the Movement is his property is wrong, for the movement is for all.  Cdr. Garang Mobil. I thank the leaders. Since 1997 I decided to stay in my house because I did not believe that our problems should be solved by violence. Facts must be stated now in order to solve them once and for all. On the ‘orphans’ there six (6) members who died and only two (2) are left. The question I want to discuss today, is that there is a problem but the Chairman keeps saying there are no problems, only a ‘gap’ between him and Cdr. Salva. He will not accept there are problems in the New Sudan. But if the problem is not solved, there will be no peace. I also want to say that the movement is in the hands of a few and many are alienated. National resources must be shared by all, no matter how small it is. The structures are controlled by a few minority groups, and this must be sorted out now in Rumbek. This minority group is the problem; hand picking people must stop now because it is creating problems.  Cdr. Agassio Akol. There is a problem because many people avoid Cdr. Salva as Deputy Chairman and Chief of the General Staff. The Governors and their deputies bypass Salva and correspond directly with the Chairman of the Movement, which I consider to be outside proper procedure. Cdr. Salva said that in his talks, he raised specific issues which he needed answers on. The Chairman must have failed to answer these issues, otherwise, the talks would have ended. Cdr. Salva said he did not blame anyone but the Chairman. He wanted the Chairman to tell him whether he was wrong or not. For example Cdr. Salva questioned the legitimacy of the leadership Council, as he considered it to be illegal.  Justice Ambrose Riny. I greet the Leadership and SPLA officers. In 1994 the Convention created institutions. When I talked about the independence of the Judiciary, many officers reacted against it. It was the intervention of the Chairman who permitted the Committee to complete its work. There have been difficulties and roadblocks by those who did not want a system. There have been difficulties in implementing the resolutions. In 2004, the leadership Council was set up to replace the NLC and NEC. The Leadership Council has no legal base to exist. The Chairman dissolved legally instituted organs of the movement as contained in the national convention of 1994, but unilaterally established illegal institutions which are not supported by any legal provisions of the convention thereof.  Mama Kezia. I thank both leaders for coming together to discuss all the issues. I was happy with the 1st Vice-Chairman for saying everything in his heart. The rumours outside are bad. Both leaders say it was only a misunderstanding. I appreciate what is happening and I call upon Rev. Clement Janda to bless our conclusion. I agree with the 1st Vice-Chairman that there is something wrong with our system. After the death of the Chairman of my commission, no one has been appointed, and therefore there is no one to report to. For me it took three (3) years to see the leader of the movement. There isn’t a good system. But I think that from now on there will be a system in place.  Cdr. Pieng. Greetings. I will be saying something different; that I have not been happy with our meetings that end without resolutions. I am a revolutionary soldier. I have both military and political interest and if anybody things I don’t have both, he is lying. I am not happy with the response of the Chairman; there are problems to be addressed, and these problems must be solved now.  Cdr. David. Greetings. I blame the Chief of the General Staff for having failed to do anything until now. But nothing is too late; I suggest that the army be organized now. First create a General Command for the SPLA, for there is no army without a General Staff.  Cdr. Oyai Deng. I want to add my voice of being happy to participate in this meeting. When the movement started, you were seven (7) and now you are only two (2) remaining. Some said that you conspired against those who died and now you are conspiring against yourselves. I am shocked to hear Cdr. Salva talk here only about Bahr El Ghazal and not the South in general give he is a leader for all. I strongly agree with Cdr. Salva that when the Chairman goes away, he locks the South in his bag. This is wrong. Cdr. Salva has the right to question anything wrong. There is a problem that must be solved by taking the right decisions.  Cdr. Gier Chuang. I understand what is happening; I didn’t believe that Dr. John will sit near Cdr. Salva again today. I am happy to see this conference. Many people have died due to internal differences and I refer to what had happened in the 1991 crisis. There must be resolutions for all issues, which bring about conflicts; there must be committees established, specially for the SPLA. I also pointed out that during the December 2003 meeting in New Site, there were no representatives from the army. What is a government without an army.  Cdr. James Oath. I greet the gathering. When the movement started you were seven (7) and now you are only two (2) – five died having problems with you (Dr. John). Why do you have problems with your colleagues? The leadership has disabled the movement, so why keep it? Why is there a GMC, because it has never met until now? There is no SPLA ready to fight, and for me there is no army to order. If I am ordered to arrest Cdr. Salva, I do not have an army to arrest anyone. Even the Chief of Staff cannot order me to do anything because there is no army. There is no chance to meet the C-in-C – it will take long time to meet him. This is not good, therefore a committee must be formed now to sort everything out.  Cdr. Oboto Mamur. Greetings. The Chairman always had problems with his colleagues. Now you are two (2) and you are turning against yourselves. Chairman you have been lying throughout since 1983. A Chairman should trust his deputies because there is a big problem here. I ask the Chairman whether he has mandated us to judge him? And if so, we will pass our judgment on him now. We don’t want to talk for the sake of talking. There must be a committee to follow up on all the resolutions agreed on here. And I add, the convention will not solve our problems.  Cdr. George J. Deng. This meeting is a good opportunity to talk today in front of other commanders. The reply by Cdr. John to Cdr. Salva is not convincing at all. My suggestion is that a committee must be formed to organize things right away. There is no longer any army. Therefore a committee has to be formed for the agreement to succeed. I view the SPLA as my home; if the leaders want to go then it is up to them.  Cdr. Malong Awan. Everyone is waiting for the outcome of this dispute. Both leaders therefore should solve their differences. If they don’t solve their differences then they should remain inside this room until the crisis is over. Nor should we blame our enemies for the rumours came from ourselves – we should not blame outsiders. For example Ayen Maguat went to talk to Cdr. Salva. Many from Yei volunteered to go to talk to Cdr. Salva. She complained that Cdr. Wani Igga was in Yei but failed to talk to Cdr. Salva. Instead he went to his village. This was not good leadership and I disagree with Cdr. Wani Igga’s position.  Cdr. Santo Ayang. I thank the communities of Bahr El Ghazal, Bor and the committees that went to Yei. Without them things would have got out of hand. The Chairman must tell us the truth about the source of these rumours. All that was circulated was not rumour, and no one was bribed by the enemy. You tell the world that you brought peace to Sudan, but the reality is that peace was brought about by those who fought for it and died. Those around you only please you and do not tell you the truth. I support the formation of committees suggested by Taban Deng Gai.  Cdr. Ayuen Jongror. The conflict is within the leadership. When conflict arises, it must be resolved immediately. The two of you must be in one place and not in Nairobi and Yei. The style of your leadership is causing lots of problems. The GMC Secretariat was supposed to be formed, but since then, nothing has happened. The GMC should meet to discuss the issues of the army and structures of the Movement must be formed before the convention.  Cdr. Elias Wai. There is fire so we need it not to burn further. Cdr. Salva is not convinced. All are not convinced with the reaction of the Chairman towards issues raised by Cdr. Salva Kiir. The Chairman is placing his relatives in key positions including Elijah Malok, too old, for example, to hold the position of Governor of the Central Bank. Note, there might be popular uprising one day and the army will join the public.  Cdr. Jadalla. We are here to solve our problems. Committees should be formed to investigate the rumours. You think you are the founder of this movement, and as such, that you can do what you want without consulting people? The public is not ready for more problems.  Cdr. Patrick Aitang. We are talking about rumours, but what do we do next? The letter alleged to have been written by Equatorians caused serious tensions. Thanks to Cdr. Salva for salvaging the situation. The ball is now in the court of the Chairman and he should come out with the facts leading up to this dispute. The Chairman should be bold and form the necessary structures.  Cdr. Kitchener. The Chairman and Salva should work together until the end of the liberation struggle. We need leadership to lead us.  Cdr. Dominic Dim. I agree that the Leadership Council should be abolished and the commissions replaced by the NEC. The Chairman has locked the NEC in his boxes. Dr. John’s response to Cdr. Salva was neither good nor sufficient. For me, there is still a problem as people still remain suspicious of the Chairman’s intentions. I reiterate that if the problem in question is not resolved, there will be a bigger problem in the Movement. I suggest that the Chairman be clear on resolving this conflict. We should remember how General Swar El Dahab was forced to take over during the crisis at that time. Cdr. Salva was asked by many people to take over, but he refused to do so. I support the formation of committees to restructure the movement and provide us with collective leadership.  Cdr. Bior Ajang. I thank the previous speakers. Cdr. Salva has the right to blame the Leadership Council. The rumours are no longer rumours, but facts as said by Cdr. Salva. There is a problem and that problem should be solved now. I support the formation of committees. What transpired in Yei was the product of two rumours; 1) the arrest of Salva Kiir, and 2) the dismissal of Cdr. Salva Kiir.  Cdr. Ismail. We should combat the rumours. It is very unusual for a Deputy Chairman not to have easy access to the Chairman. However, forming committees is another way of avoiding the problem. The explanation of the Chairman hasn’t convinced most of the people nor answered what was raised by Cdr. Salva. &#61502; Cdr. Dau Akec Deng. I thank the 1st Vice-Chairman for his stand.  Lt. Col. Mathiang Rok. This meeting has saved the lives of many people in the South. I would like to quote from Francis Mading’s book; “things that are not said divide people”. The Leadership Council has taken the powers of the NLC. People still doubt the Chairman’s comments were satisfactory. There are many ‘huddles’ in the system, e.g. the Leadership Council has taken up the role of the National Convention. Our main concern is how the structures will be made functional. We are here to bring peace and harmony among ourselves. If there is anything, which is not clear, it should be said now!  Cdr. Chagai Atem. These rumours started in 1994 and I was the chief negotiator between the two. Now they are caught red handed again.  Father George Kinga. I greet and thank the leaders. The four leaders are great and must be respected. The issues are institutional ones. I also support the formation of committees.  Mr. Pascal Babindi. I am happy to have the chance of addressing this important and historic meeting. The restructuring we decided on at the Gorok NLC meeting pushed us ahead. I am confident that the reforms that shall soon be made will also push us ahead.  Cdr. Achol Marial. A committee should be formed to investigate into where those rumours originated from. I appeal to the leadership to mobilize resources prior to the formation of ministries.  Dr. Komanyangi. The formation of committees shall lead to a final solution to all our problems. I suggest that we give ourselves time for these deliberations to continue for one more day so that all issues are exhausted.  Cdr. Simon Kun Pouch. The speakers have not talked on how to combat corruption. The formation of a committee to work out functions for our structures is not really a priority because they already exist, we need only to share power and prepare job descriptions for all the institutions of the movement.  Cdr. James Kok Ruea. A preparatory committee for the Convention should be formed within the shortest time possible. We should work on the structures that will make the Movement function during the interim period as follows: 1) 1st Vice Chairman to chair the GMC, 2) 2nd Vice Chairman to chair the committee for the interim period and 3) 3rd Vice Chairman to chair the committee for National Convention.  Mr. Muhammad Marjan. I believe that the world is looking forward to knowing what our movement will be like once peace is signed and we emerge as a government.  Cdr. Michael Makuei Lueth. There is no need to form a committee to investigate the rumours, which were circulating, unless Cdr. Salva insists that they have never been rumours. I call upon both the Chairman and Cdr. Salva to build confidence between themselves. I assure the Chairman that as we are entering a new era, and if we remain in an unprepared manner, we will eventually be finished. The immediate establishment of our structures is necessary. The distribution of powers is also necessary. The army must be organized. There is also the importance of speeding up South-South dialogue before we enter the forthcoming era. The other issue is corruption. I am saying that the leadership is not committed to fighting corruption. I am against the suggestion that there should be a committee for the army’s reorganization. It is for the COGS, his deputies, and the directors to sit at the GHQs and issue orders according to the plans they set. The national Liberation members sh! ould not blame the Chairman alone. In Gorok, the NLC gave the Chairman a blank cheque to restructure the movement, and that was when things started to go wrong.  Cdr. John Luke. I am happy that the rumours have been resolved. The rumours of the dismissal of Cdr. Salva has been on air for a long time. There were other rumours that Cdr. James Wani was going to be replaced by Cdr. Pagan. Some responsible people in the Leadership Council have been quoted as saying that Cdr. Salva, with support from Bona Malual, will make a coup. There has been a problem among members of Leadership Council who have been complaining a lot. There is no system, especially in the office of the Chairman, which is treated as a private entity. The office of a leader must be well organized and staffed properly to do its work.  Mr. Arthur Akuien. I am being called the Finance Secretary but without any finance. I want to point out that the rumours have been destructive and that the leadership style encourages such rumours. I want to say that the Chairman does not delegate powers to his deputies. The Chairman is responsible for creating this crisis in the movement.  Dr. Justin Yac. The Chairman is good for external contacts but within his own institutions he is not good. The Chairman is good in talking but poor in doing things. The Cdrs. Condemned him the day before and I quote Cdr. Salva who said that “Dr. John does not forget and does not forgive”, and who ever quarreled him ended up dead.  Cdr. Elijah Malok. I propose the formation of three (3) committees, and that they remain here in Rumbek to start their work as we may have problems with resources and the committees should finish before December 31st.  Cdr. John Koang Nyuon. I thank the Chairman and his 1st Deputy to have responded positively to our wish to sit, as we are doing now to discuss and resolve issues that create misunderstandings. Rumours always create problems. The availability of Thuraya telephones in abundance is really a problem as some of their users can verbally reveal our secrets for the sake of money or any other reason. The reaction by some officers is appreciated, as they only want the resolution of our outstanding problems.  Cdr. Abdelaziz Adam Alhilu. The structures formed during the 1st national convention exist, the only thing is that they are not effective due to meager resources. The lack of adequate resources is the main problem that affects their functioning. Instability is also a factor. A system normally operates when the enemy is inactive.  Cdr. Daniel Awet Akot. This is a good opportunity for one to air out what had been said before, As Dr. John and Cdr. Salva put it, that they don’t have personal or political problems – then that is appreciated.  Cdr. Ayuen Alier. If the style of leadership is changed, things will automatically change for the better. The whole issue is our general problem not only the Chairman and his deputies. Our top leaders restricted travel to Nairobi with their officers, but that cannot work. Every-body gets there on his own. There is a necessity that capacity building starts now. Cdr. Ayuen made the additional observation, that the lack of self- confidence is always the cause of our problems, and as for rumours, which have been confusing, I assure you that those who have self-confidence cannot be affected by rumours.  Cdr. Kuol Manyang. I think this meeting is historical and as we enter a new era, we are going to be more united after this meeting. You differ with someone and you reconcile. Differences are natural. A person can easily make a problem between him and another. We have to unite and this is how you can overcome rumours, which confuses the people. Like the recent situation, I was informed through unofficial channels that Cdr. Salva had been removed. I called Cdr. Deng Alor and we were joined by Cdr. Awet and we went to Cdr. Salva and told him that what is being alleged is a lie, and that there was no meeting held concerning this. We then moved to Nairobi where we communicated this issue to Dr. John Garang and that was when this meeting was planned and Cdr. James Kok and Cdr. Nhial were asked to organize transportation to this end.  Cdr. Nhial. People should be judged by what they have contributed to the Movement. We should sincerely address our issues. I am absolutely prepared for the proposal to dissolve the Leadership Council and we all see what scenario we can take.  CDr. Malik Agar. The current issue of the differences between the Chairman and his deputy is surprising in that I was aware of this even ten years ago. Whenever it is about to be addressed, each of them says there is ‘no problem’. The big problem is trust among yourselves. This needs to be rebuilt and you will be the ones to arrive at sound solutions to the existing problems.  Cdr. James Wani Igga. I congratulate the Chairman for calling this important meeting. I also congratulate Cdr. Salva for having attended this meeting. This paves a way for a solution to our problems. I thank both of you for your patriotic stand since the beginning of the struggle – both of you have collectively worked to protect this movement from upheavals. I consider you as the central pillars of this Movement. Let me come to the main topics, which are the SPLM/A’s major problems. Solving a problem is like bringing pus out from somebody’s gull. Problem No. 1, we are not working as a team, which results in disgruntlement.  Cdr. Riek Machar. I was struggling whether to speak or not because of the nature of the issues being raised. When we met as a Leadership Council, there were divergent views. Before that I met Aleu Anyieny and he told me that if you are going to talk to Cdr. Salva, don’t talk about the problems being personal. These problems are administrative. Serious rumours have also been circulating in London when I was there. They talked about a ‘change of the guards’ and the removal and replacement of Cdr. Salva by Cdr. Nhial. I appealed to the participants in that meeting that we should unite since we are entering peace, because if there is a split, the enemy may dishonour the agreement we had already signed. In any case, suppose we sign the peace, the SPLA will be a national army whereas the SPLM will be competing with other political parties. The SPLA must retain an independent national character.  Cdr. Salva Kiir Mayardit. Greetings to the Chairman and Madame de Mabior and others in this meeting. We apologize for not allowing you to attend the first meeting, which lasted for two days. The second meeting is composed of SPLM Counties Secretaries, civil society, women groups, the youth, etc.. The decision was deliberate and we did not want the meeting to be talking shop. I thank those who have exerted efforts to travel from their various locations to Yei where they met me on the situation. As I told you, there were no personal problems, they are administrative given my profession, and I know that rumours are dangerous. Rumours must be treated as rumours, but there is no smoke without fire. I don’t agree with Cdr. Wani that these rumours were created by the enemy. There are people among us who are more dangerous than the enemy. I must warn the Chairman that Nimeiri was made to be unpopular by his security organs. Those who are misleading you and giving you false security information about others will suffer with you together or leave with you. The government, which is going to be led by you must include all. Without unity, the agreement will be a source of our disunity. We are not organized in all aspects, and as such will be exploited by other political parties that are more organized. The lack in our structures and political guidance will l! Minutes of Historical SPLM Meeting in Rumbek 2004. At the end of 2004, while the Sudanese people were closely following Naivasha peace talks with a lot of expectations for freedom and democratic transformation, the Sudan People’s Liberation Movement (SPLM) was plagued with rumors and accusations of conspiracy. To put an end to this acute crisis, an extraordinary meeting was convened to dissipate rumors and misunderstanding related to the removal of the deputy chairman of the SPLM, Salva Kiir Mayadrit and his replacement by the young Nhial Deng Nhial. The importance of this meeting stems from the fact that it safeguarded the unity of the SPLM at a critical stage and paved the way for signing the Comprehensive Peace Agreement (CPA) on January 9, 2005.The following is the full text of the minutes of the three-day meeting which took place in Rumbek from November 29 to December 1, 2004; one month before the signing of the CPA. One on 14/11/004 (No. 001/11/004) to address the following accusations/rumours; • That there was a meeting held in Nairobi under the Chairmanship of myself where Cdr. Salva Kiir would be replaced by the Chairman with Cdr. Nhial Deng. • That Cdr. Malual Majok went to Ramciel to collect forces to go and arrest Cdr. Salva Kiir Mayardit at Yei.They are all lies and a big propaganda initiative. Cdr. Machar then welcomed Cdr. Salva Kiir Mayardit to brief the national leadership meeting where he welcomed the Chairman and C-in-C and the national leadership. ‘I confirm the two messages read to you by the Chairman are all true. The rumours came from Nairobi and around the leadership of the SPLM/A. The second message I got was through Cdr. Pagan Amum who was visiting the liberated areas with friends from friendly countries. I requested Cdr. Mabior Kuer to ask the HQs why I am not talking directly to the Chairman. I spoke to the Chairman when he was in Kampala and he told me that I should meet him in Yirol, which I didn’t reply to in the light of the rumours.The rumours implied that I will be arrested at Ramciel where the Chairman was, so I decided not to go. When I received that rumour, I called the security personnel in Yei and discussed the issue in length with them. I also informed them to find out where the sources of the rumours from Nairobi were coming from, which they did. The Chairman killed the national Executive Council (NEC) by creating the leadership Council. But there is no provision in the Convention for a ‘Leadership Council’. Does he want to revive the Political Military High Command? The Leadership Council creates a situation where all are directly reporting to the Chairman – including SPLM County Secretaries. When I mentioned these facts, they should not be construed to be my personal or family problems. Those around the Chairman don’t tell him the opinion of the public. The Chairman is everything, from a finance officer to one at the lowest level.Corruption, as a result of the lack of structures, has created a lack of accountability, which has reached a proportion that will be difficult to eradicate. The other issue I would like Comrade Chairman to address is how the CANS structures are now operating, e.g., take the absence of the SPLM Regional Secretary for Bahr El Gazal from his area of responsibility while there has been sporadic tribal feuds within the region – and which has resulted into sectional conflict. The Chairman most of the time send Cdr. Deng Alor on foreign missions which were supposed to be the work of Cdr. Nhial Deng.There are several other administrative issues that require correction. We are three Deputies without functions. The Chairman is responsible for all systems including the Army General Headquarters. Our HQs. started in Yei, then Rumbek, then new Cush and now Ramciel. When are we going to establish our HQs? The deputies of the General Staff are the ones commanding the forces; they should stay in the General Headquarters instead of commanding. Yet the Chairman is the one who dismantled the General Headquarters. Comrade Chairman, the establishment of the General headquarters hasn’t been fulfilled and this I have been requesting ever since Yei was liberated. Branch officers such as the Director of Military Intelligence and his deputy are now in your Headquarters, though they are supposed to remain at the General Headquarters. The Chairman concentrates on his headquarters forgetting the rest of the army. It is only his headquarters, which has military uniforms, boots and other supplies. I would also want Comrade Chairman to give me full powers of the Chief of the General Staff (COGS) to enable me expedite the regrouping and reorganization of the SPLA, and if Comrade Chairman sees that I am not able to do that job, then he can appoint another person to do it.The Chairman is to be 1st Vice-President of the Sudan and the head of the Government of Southern Sudan, but he is not talking to Southerners. The North is organizing southern militias so that we fight among ourselves. We must unite our own ranks and not just unity with the north. On a personal basis, I don’t have any problems with the Chairman but our working relationship is bad and leaves a lot to be desired. Edward Lino thanked the Chairman and said we are really in need of resolving the problems within the SPLM/A. The people of Abyei are accused of being Dr. John’s supporters and as such, are victimized for that. Cdr. Pieng made an intervention that Cdr. Edward was not addressing the issues. Cdr. Elijah Malok stated he really supported what Cdr. Salva Kiir said, and recommended that a collective leadership be created. Here in Bahr El Ghazal Cdr. Deng Alor has been away for too long and these are known facts; the leadership council should address and resolve these outstanding issues and go back on the right track. Let us form committees to reorganize the army, since all the units are here. I don’t believe what Cdr. Mayardit said about the people being victimized. Structures are to be recognized right way as a government so let us reorganize them and work in the right way as a government.Dr. Justin Yac. I will go with the suggestion of Cdr. Pieng that the Chairman response to the issues raised by Cdr. Salva Kiir. And all the four happened.The allegation that I was going to dismiss Cdr. Salva and arrest him was not only a lie, but it did not even occur in my mind. I was preoccupied with the peace process and not trying to create a crisis. Before UN Security Council Meeting, I received a telephone call from President Bush who said that he now had those who will work with him during the next four years and that I am one of them. President Bush said, “John don’t let us down. We want peace before the end of the year”. The allegation that I will be replacing Cdr. Salva was a bad lie. If Cdr. Salva was dismissed and replaced with Cdr. Nhial Deng Nhial, it would mean that I would have dismissed all those senior to Cdr. Nhial which includes Cdr. Riek, Cdr. James, Cdr. Daniel Awet, Cdr. Lual Diing, etc. – which would be bad for the Movement. So this allegation is a lie. The crisis only has the support of our enemies who want a crisis in the Movement. This situation was created by our enemies because they do not want to sign the peace agreement.The Chairman pointed out that the GOS has never been happy with the protocols, specially the Machakos protocol, because of the self-determination clause. The GOS and their supporters don’t accept the security arrangement and the Wealth Sharing Agreement, which gives the South of Sudan 51%. The Khartoum Government wants to reject the agreement being signed or at least delay it. By delaying in signing, Khartoum will gain $2.5 billion from the oil revenues, which we must prevent by all means possible. Khartoum was unhappy with the Power Sharing and 3 areas protocols. Neither I nor Cdr. Salva had any interest in delaying the peace agreement. I have nothing to gain by dismissing Cdr. Salva.Finally I have never had any thought of dismissing Cdr. Salva. And it should be considered a lie. This rumour has caused commotion everywhere in Southern Sudan, Khartoum and the Diaspora – so I will assure our people everywhere and send a strong message to Khartoum Government that they will not divide the SPLM/A. As for the Government of Southern Sudan (GOSS), there will be representation based on the states, fairness and justice. Similarly at the Central Government, there will be State representation. All Governments, whether GOSS or State Governments will be based on modern standardized structures.The army will be organized based on modern standards. The SPLM will be reorganized democratically. There will be a mult-party system. There will be no need for coup d’etat anymore, so for example my friend Dr. Riek Machar will not need to make a coup because he can form his own party if he is discontented with SPLM. South-to-South dialogue must be organized properly, but the leadership has refused outside mediation. I told the European groups about our stand on this. The Power Sharing protocol states that the SPLM will form the Government in the South. The protocol give 15% to non-SPLM/A members and 15% to members of other parties. There will be discussions therefore with Southern parties.On Civil Society, we need to dialogue with them including the Churches. On top of that, lawyers and other concerned members will write a constitution for Southern Sudan. There will be a constitution for states and the rule of law will be established. Cdr. Agassio Akol. There is a problem because many people avoid Cdr. Salva as Deputy Chairman and Chief of the General Staff. The Governors and their deputies bypass Salva and correspond directly with the Chairman of the Movement, which I consider to be outside proper procedure. Cdr. Salva said that in his talks, he raised specific issues which he needed answers on. The Chairman must have failed to answer these issues, otherwise, the talks would have ended. Cdr. Salva said he did not blame anyone but the Chairman. He wanted the Chairman to tell him whether he was wrong or not. For example Cdr. Salva questioned the legitimacy of the leadership Council, as he considered it to be illegal.The National Convention is unlikely to come soon to solve the problems of our structures; the convention has no importance for now. For Cdr. Salva, structures cannot be done by a Convention. So who is going to organize the army? Cdr. Mark Nyipuoc intervened by saying a press conference should be made. I want to say that a lot has been done by a few. Most of the things done are imperfect, but they have served us. I appreciate what has been done on South-South dialogue under the SPLM/A Secretary General. The Chairman was supposed to establish a constitutional committee to draft our constitution. We must come together in a place where all departments are residing; there should be one center for the government of SPLM/A to stop all these rumours.I would like to point out that many members of the movement have lost their ability to sit in an office. I want to point out an incident where a commander told me that what Dr. John or Cdr. Kuol Manyang say ‘up there’ does not work in the South. What kind of a system is this, if it is not respected by its officers? There is no system respected in this movement. I suggest that a committee be formed to organize the army and a conference to inform the world and our supporters that there is no problem from within. Cdr. Pieng. Greetings. I will be saying something different; that I have not been happy with our meetings that end without resolutions. I am a revolutionary soldier. I have both military and political interest and if anybody things I don’t have both, he is lying. I am not happy with the response of the Chairman; there are problems to be addressed, and these problems must be solved now.The Chairman has not committed mistakes; for me, they are unintended mistakes, for the Chairman could not create problems for himself. I mentioned that during the time of Kerubino there were problems. There were rumours that the Chairman was going to throw away his SPLM/A cadres and replace them with people who have not been in the movement since its inception. There must be committees to reorganize the movement; I agree with Cdr. Elijah Malok’s call for a system and committees. When the Chairman goes away on a visit, he never leaves anyone to act where officers should report to. Cdr. Gier Chuang. I understand what is happening; I didn’t believe that Dr. John will sit near Cdr. Salva again today. I am happy to see this conference. Many people have died due to internal differences and I refer to what had happened in the 1991 crisis. There must be resolutions for all issues, which bring about conflicts; there must be committees established, especially for the SPLA. I also pointed out that during the December 2003 meeting in New Site, there were no representatives from the army. What is a government without an army. Cdr. Bior Ajang. I thank the previous speakers. Cdr. Salva has the right to blame the Leadership Council. The rumours are no longer rumours, but facts as said by Cdr. Salva. There is a problem and that problem should be solved now. I support the formation of committees. What transpired in Yei was the product of two rumours; 1) the arrest of Salva Kiir, and 2) the dismissal of Cdr. Salva Kiir. Cdr. Salva Kiir gave us the chance and invited us to meet. I thank the bodyguards of Salva for handling the situation very wisely. Dr. John has no powers to dismiss Cdr. Salva because the national Convention elected both of them. I emphasize that rumours do not only originate from Nairobi. Yei is also a source. I support formation of committees. Cdr. Achol Marial. A committee should be formed to investigate into where those rumours originated. I appeal to the leadership to mobilize resources prior to the formation of ministries. Mr. Kosti Manibe. I want to add my voice to those who have already spoken. I express my appreciation to those concerned for having resorted to peace negotiations and to end the conflict through dialogue. I am happy that the 1991 disaster has been avoided. I acknowledge the existence of gaps in the system and I call upon the leaders to address the communication needs. I stress the need for media to send accurate messages to our people, enemies, etc.. The Movement should have a capacity for communication to deal with the media when required. I point out that a lot has been achieved – 90% of the objectives have been achieved. There are structures, but a lot of work requires to be done. On the responsibility of leadership, Cdr. Dr. John should not be blamed alone because there are others. The dissolution of the Leadership Council will not mean that a normal system will be established. No proper changes will take place, even if the Leadership Council is dissolved. If Dr. Garang dissolves the Leadership Council, he will appoint the same people in the L.C. There is no need to make changes now until peace is signed. The formation process f or the government needs wide consultation; people should wait for a month until peace is signed.The Chairman is being accused for not implementing decisions. In the army, if you need structures, I see Cdr. Salva as a political figure; so a pure army officer should be appointed as Chief of Staff and Cdr. Salva should be given a Commission. This way, the army should be run by an army officer who is not a politician. Cdr. Marc Nyipouch. Cdr. Marc stated that the rumour that madam Nyandeng was arrested with 3.5 is libel and defamation. He continued to cite the case of General Lagu during the Regional Government. On the issue of Governor Deng Alor, Cdr. Marc said that Cdr. Deng collects money from abroad, banks it with the Chairman’s or his (Deng’s) bank account, and that is why Deng Alor was taken away from the region – just to do that. Something Nhial has failed to do but what Deng is able to do. Deng should either be a Governor of Bahr el Ghazal or be replaced. Cdr. Ayuen Alier. If the style of leadership is changed, things will automatically change for the better. The whole issue is our general problem not only the Chairman and his deputies. Our top leaders restricted travel to Nairobi with their officers, but that cannot work. Every-body gets there on his own. There is a necessity that capacity building starts now. Cdr. Ayuen made the additional observation, that the lack of self- confidence is always the cause of our problems, and as for rumours, which have been confusing, I assure you that those who have self-confidence cannot be affected by rumours.The suggestion by Cdr. Elijah Malok that committees be formed and start their work here in Rumbek is supported by me. The delegation for the peace talks should be the only ones to go: let us support peace because it is the requirement for now. Mr. Chairman I end by thanking both of you for having cooled your nerves. Come together to discuss so that we can resolve whatever problems are facing us. So I thank both Cdr./Dr. John Garang and Cdr. Salva Kiir for having attended this meeting and permitting us to discuss and come up with decisions that promotes unity and harmony. Differences between Cdr. Salva and Dr. John existed from a long time ago, as Cdr. Chagai mentioned, but there was no decisive steps taken to resolve them until today.As for structures, they are there. The only problem is how to maintain and have them effectively function due to a lack of resources. Our structures have to be operationalized. But the matter is not a question of dissolving other bodies such as the Leadership Council, NLC and so on. I don’t have any objection with the formation of committees, but I only say that reorganization of the army must be the responsibility of COGS and his Deputies. I urge both of you, the Chairman and Cdr. Salva to open a new page in order for us to go forward. Cdr. Malik Agar. The current issue of the differences between the Chairman and his deputy is surprising in that I was aware of this even ten years ago. Whenever it is about to be addressed, each of them says there is ‘no problem’. The big problem is trust among yourselves. This needs to be rebuilt and you will be the ones to arrive at sound solutions to the existing problems.Comrade Chairman, as we enter the new era, we shall be competing with other parties. Let us start with the effective establishment of our structures and draw up our programmes. We need a system. I have worked as a Governor for ten (10) years; yet, I could have committed many mistakes during that time. Has the Chairman any day called me to tell me that I have made a mistake? There is no system here. Cdr. Pagan Amum Okech. Comrade Chairman, I will focus on the crucial issue, but before that, I want to tell you this. We are here to discuss the rumours that have been circulating and which almost created a very serious development within the movement’s liberated areas, in Khartoum and among the Diaspora. My advice is to the Southerners who have fought for the last twenty two (22) years. I am first going to concentrate on the recent rumours. Cdr. Gier happened to ring me asking me whether I came across information from Yei that the leadership have met and decided to remove him from the second position. I advised Cdr. Gier not to believe that because it is a rumour, and if it spreads, it will create confusion. He then heeded my advice. Again Cdr. Deng Alor phoned to me on the same issue, but I also told him that these are rumours and Cdr. Salva should not believe such rumours. There had been meetings in Khartoum and there was a public statement made by Uncle Bona Malual and retired General Joseph Lagu. If the enemy succeeds in dividing us, it may lead to our failure and peace may not be achieved.This time is very critical Cdr. Salva and Cdr. Chairman; if we say we will remain here to deal with the rumours only, I think we will be here up to the coming year. I advise both of you to put aside these rumours. Even though we did not defeat the enemy, what we had achieved will make the enemy coincide with what we tell them. At this crucial moment we must think thoroughly of what we should do to enable us go forward. This is my appeal to both of you Cdr. Salva and Cdr. Chairman. There is another rumour now that I want to take the place of Cdr. James Wani Igga. I assure you Cdr. Wani that there is nothing like this at all.The establishment and building of structures at this particular time is vital. Our priority is now to finalize the peace talks. The Chairman and his deputies must go to Nairobi so that we are not considered intransigent because the process can easily be derailed. Concerning the reorganization of the COGS and his deputies, we can do that unless the problem of resources hinders us. Cdr. James Wani Igga. I congratulate the Chairman for calling this important meeting. I also congratulate Cdr. Salva for having attended this meeting. This paves a way for a solution to our problems. I thank both of you for your patriotic stand since the beginning of the struggle – both of you have collectively worked to protect this movement from upheavals. I consider you as the central pillars of this Movement. Let me come to the main topics, which are the SPLM/A’s major problems. Solving a problem is like bringing pus out from somebody’s gull. Problem No. 1, we are not working as a team, which results in disgruntlement.No. 2, we have the structures formed in the 1994 Convention which were only the NEC & NLC, but by 1998, people became fed up of those structures. I appeal that we keep these structures but make necessary changes. I would like to underline something connected with structure. In 1998 we came out with a constitution named the SPLM constitution. This was not passed by the NLC because they were expecting a state constitution. But we had agreed to use that constitution, and there are structures there. In one of the L.C. meetings we had revised the constitution and even the manifesto. Up to now, we had passed four (4) documents. The SPLM constitution. The SPLM manifesto. The 3rd document is the SPLM policy on dialogue and it concerns how we go about South-South dialogue. Our main constraint in starting South-South dialogue is the lack of money. Documents No. 4, is the SPLM policy on the transformation of Sudan. All these documents are there ready. Comrade Chairman, our constraint in the political Affairs Commission is lack of facilities, but we have really tried our best. As for the army reorganization, if we become surprised by the signing of the peace deal, I think it will be difficult to regroup our army simply because we don’t have resources. Once peace is signed, there is going to be the establishment of standard national structures. Structures are our No. 2 problems, including the official management of office institutions. Problem 9: Lack of cooperation, accompanied by sabotage. Some work for the downfall of others without any accountability. I believe that unless something happens in Khartoum, the war is over. Unless the enemy causes us to split, the war is over. This requires us to expedite the reorganization of the army. I do not agree with Mathiang Rok about his suggestion that committees be formed to discuss the six (6) signed protocols. In addition, we should be privileged that the UN SG visited Africa to discuss the issue of peace in Sudan – The first time it happened was during the decolonization of Africa – making the achievement of peace highly likely this year.As for South-South dialogue, we can start now. We should be prepared to negotiate with whatever party is ready to dialogue. If we wait until the government is formed, they will be the ones to undermine the GOSS. We must achieve consensus. Let us not delay south-south dialogue. The lack of dialogue can be a source of disunity, but if we handle it properly, it can also be a source of unity and this will allow the people to rally behind the leadership. There is a need to call the NLC as soon as possible to deliberate on the agreement. What I mean is the current NLC. The next convention, which needs to be convened as soon as possible, will elect a new NLC and who will be charged with the responsibility of working on a national constitutional government of south Sudan, etc.. From now, we have agreed that the judiciary be independent.Session 5Cdr. Salva Kiir Mayardit. Greetings to the Chairman and Madame de Mabior and others in this meeting. We apologize for not allowing you to attend the first meeting, which lasted for two days. The second meeting is composed of SPLM Counties Secretaries, civil society, women groups, the youth, etc.. The decision was deliberate and we did not want the meeting to be talking shop.I have no more to say. The issue which brought us here have been raised and you all have given your concerns. Let us take the line of peace to be the priority. In the absence of peace we must be prepared for war. There had been many Security Council resolutions of the same nature passed like this of Sudan, but have not been implemented, such as the PLO, Western Sahara, etc..I thank those who have exerted efforts to travel from their various locations to Yei where they met me on the situation. As I told you, there were no personal problems, they are administrative given my profession, and I know that rumours are dangerous. Rumours must be treated as rumours, but there is no smoke without fire. I don’t agree with Cdr. Wani that these rumours were created by the enemy. There are people among us who are more dangerous than the enemy. I must warn the Chairman that Nimeiri was made to be unpopular by his security organs. Those who are misleading you and giving you false security information about others will suffer with you together or leave with you. The government, which is going to be led by you must include all. Without unity, the agreement will be a source of our disunity. We are not organized in all aspects, and as such will be exploited by other political parties that are more organized. The lack in our structures and political guidance will lead us to a very serious political defeat. Mr. Chairman, you have talked about people eating the boat while we are in the middle of the river. Let me add this; the issue is not eating the boat in the middle of the river. The issue is that there are a few who have already crossed to the other side of the river and when the remaining ones asked them to bring the boat, they refused to return the boat. This is the problem. That Chairman said it is Cdr. Salva Kiir that wrote the letter by Equatorians. That Cdr. Salva Kiir is being dismissed and replaced by Cdr. Nhial Deng. The story that Cdr. Salva is marginalized and his work given to others. This feeling might have developed when Cdr. Salva no longer went for the peace talks and therefore I increasingly worked with Cdr. Nhial and Cdr. Pagan. But we all know how I took over the IGAD talks, as this was during the Officers Conference here in Rumbek. I was reluctant to go to Naivasha as you will recall and people pleaded with me including the Officers Conference. After that both of us could not be in the talks, and indeed since then Comrade Salva has been doing most of the work in the field as you can see from the very few messages I write. There are many other rumours, but these three are the serious ones around which other issues and rumours are built. Affirm that all these are false [expound convincingly at length]. ü We have 22 years of togetherness with Cdr. Salva in the SPLM/A, he has been my right hand man even when others were senior to him and up to now and he will continue to be my right hand man into peace and during the interim period … 22 years of togetherness and comradeship cannot be blown away by rumours. ü Akon story of June 2003 that out of 7 founding members, we are the only two remaining orphans of former PMHC and that we shall take people across the river. ü New Site ritual sacrifices by spiritual leaders last July cannot just be forgotten. ü My main preoccupation is to conclude and sign peace by 31/12/2004 as demanded by the UNSC, and there is only one month left, why would I create problems by arresting Cdr. Salva and replacing him with Cdr. Nhial? ü It is practically and politically not possible to leapfrog Cdr. Nhial to No.2 as alleged by the rumour mongers, for what are the practical and political implications? ü As predicted in our 1983 Manifesto it is the NIF regime [Islamic Fundamentalism] that wants to divide us, block the peace agreement and hijack the Movement, and this must not be allowed. The fact that both of us, Cdr. Salva Kiir and I are here shows the maturity of our Movement and of our people … As the saying goes the NIF hyena has barked and so it will not eat us again. ü I want to end this part by assuring you that Cdr. Salva and I are a Leadership package decreed by 1994 NC, and only a NC can dismiss either of us, and so that I intend to dismiss Cdr. Salva cannot be possibly true, I want you to dismiss this malicious lie. Cdr. Salva and I are two sides of one coin and so that coin can never be divided; the SPLM/A will never be divided; we are not shakable and the Movement and the coming peace are in safe hands; we will take the people across. How did these rumours start and who is behind them, the rumours must definitely have been created by someone or some people, and for what purpose? In my view there were two situations: (a) Situation (A) is that of Cdr. Salva, our 1st Vice Chairman and COGS that we know and that I have known for the last 21 years, and (b) Situation (B) is that created by rumours. These rumours were not created by Cdr. Salva Kiir, they were created by the NIF regime either directly in some cases or through some of our people who need money, and the purpose is clear; it is to block the peace so that it is not signed by 31/12/2004 as demanded by UNSC Res. 1574. Situation (A) of Cdr. Salva and situation (B) of the NIF are incompatible and were pulling in different and opposite directions. This is why the situation in Yei did not explode. At end the Cdr. Salva’s situation took the upper hand and won. And in this context I want to commend Cdr. Salva Kiir for controlling the situation; I commend the officers in Yei; the community leaders that were in Yei or came to Yei; others who went to Yei including members of the SPLM-LC, and finally the role played by Cdr. Pieng and Cdr. Malong in their shuttles. Why does the NIF regime want to block peace? Because they don’t like the six protocols we have signed; they don’t want the 31/12/2004 deadline and they are looking for excuses not to meet this deadline [Narrate the background as to how the UNSC came to Nairobi, the telephone call of President Bush, etc.]. The SPLM/A is the struggle and property of the people of New Sudan (South and three areas and rest of Sudan), and they have paid tremendous sacrifices over the last 22 years and in previous struggles. We must honour the struggle and sacrifices of our people by taking the struggle to its logical and final conclusion to achieve the cardinal objectives of the SPLM/A, i.e., New Sudan and the right of self-determination. These can only be achieved through conclusion and signing of the peace agreement by 31/12/2004 as demanded by the UNSC, and we must not allow the NIF or any situation to delay or disrupt this process. Across Southern Sudan and New Sudan and the rest of Sudan people want peace; that is the general cry. If the NIF regime does not hear this and we in the SPLM will deliver this peace. Assurances that this is not true and that the Chairman has every confidence in Cdr. Salva [Relate incidences, e.g., at Malual Gahoth, when Tiger’s plane crushed, at his village and Akon, sending him to South Africa and what I told him; I do send Comrade Salva on diplomatic mission – Egypt, Libya and Algeria and several times to Ethiopia in recent times, etc. Trust and confidence are intangibles that are built over time. From my side I have not lost that trust and confidence that I have had in Cdr. Salva since 1983, but if there is doubt as there obviously is given the recent developments in Yei then I want to tell you categorically here that I will work hard to repair that perceived damage. Trust and confidence are even more important now then at any other time before, because unlike in the past we shall not be alone in the post conflict era; there will be other political forces in both South and North and we will compete with some of these parties. It is our cohesiveness and solidity as a political organization that will enable us to deliver both the New Sudan and the exercise of the right of self-determination and development in general. This requires the social capital called trust and confidence within the leadership of the SPLM, among the cadres and among the rank-and-file. 5. Regarding Problems within the Movement and Internal Reforms. Internal reforms necessary and I have talked about this on many occasions. I am aware there is general concern among the officer corps and rank-and-file that now that peace is coming the SPLM Leadership, and specifically Dr. John, will abandon the cadres of the Movement and embrace outsiders or new comers instead [Dispel this and give convincing explanations why this is impossible to be entertained by the Leadership or by Dr. John in particular]. Include programs of education and development in the next period and how our cadres fit in. The coming peace agreement will impose new structures and there shall be full decentralization to the States and Counties. This coupled with fairness of distribution of jobs at the level of GOSS and GONU will bring justice to all our people of New Sudan. In general peace will bring us responsibilities in the following: (a) SPLM, (b) SPLA, (c) GOSS, (d) NUBA MTS GOVT, (e) SBN GOVT, (f) ABYEI AEC, (g) GONU, (h) STATE GOVTS IN REST OF NORTH, (i) SPLA National Reserve, and (j) above all a robust, strong and rapidly growing economy to provide jobs & services to our people who have suffered so much. Finally, we must hold our 2nd National Convention as soon as time will allow; we already have the resources to do it, and I here directing the full Convention Organizing Committee to sit immediately and plan and expedite preparations to ensure that the 2nd National Convention is held before the end of March 2005. Background to the UNSC Nairobi meeting and SC Resolution (sent to all units) and SPLM-GOS MOU. Negotiations by the Technical Committees started on 26/11/2004, and Ali Osman Taha and I will arrive in Nairobi on 5/12/2004 to finish the process. ü Guidance from this consultative conference and from the Leadership Council regarding outstanding issues to complete and sign by 31/12/2004. ü GOS-Militias (OAGs) and this is why negotiations are difficult, as the NIF does not want to let go of these militias. The aim and hope is to create an alternative armed Movement loyal to the NIF in the South. ü Use of their Coordinating Council reinforced by disgruntled Southern politicians. The aim and hope is to create an alternative political force in the South that subservient to the NIF. ü The NIF has actually already announced that they will implement the Wealth Sharing Protocol as from 1/1/2005 whether there is an agreement signed with the SPLM/A, or not; they have even said that they will implement it without the SPLM/A. ü The NIF aims and hopes to combine the two subservient groups (the OAGs and the political militias) to block signing of the CPA or to frustrate implementation, and to turn the six Protocols into their so-called “Peace from within” and to use the developed situation to fight and eliminate the SPLM/A. This is the meaning of what Beshir announced. The NIF aims and hopes that Southerners will fight over the 50% of oil revenues in the Wealth Sharing Protocol instead of fighting the NIF regime. ü It is generally accepted by Southerners, New Sudanists and Sudanese in general as well as by the Region and international community that no political force other than the SPLM/A can successfully maneuver out of the situation and implement the six Protocols. The SPLM/A has the vision, the record of struggle and sacrifice (social capital) and the commitment. ü We will not shy away from multi-party politics and we will challenge the NCP politically and democratically in the North if they continue to make mistakes by sponsoring south-south conflict. ü We shall also compete with and defeat all the fake political parties in the South, and let me assure you that we welcome democracy, political pluralism and elections both in the South and North. We must continue with the objective of New Sudan and the exercise of the right of self-determination. This vision and strategy is what has reached us this far, and it is what will see us through to final victory. The objective of New Sudan and the right of self-determination are not contradictory; as a matter of fact one cannot achieve the exercise of the right of self-determination except through the method of New Sudan. Those who criticize the New Sudan as being in conflict with the right of self-determination and Southern Sudanese independence fail to tell people their method for achieving the right of self-determination of Southern Sudanese independence. They end up being either AOGs or political militias to be used or manipulated by the NIF. 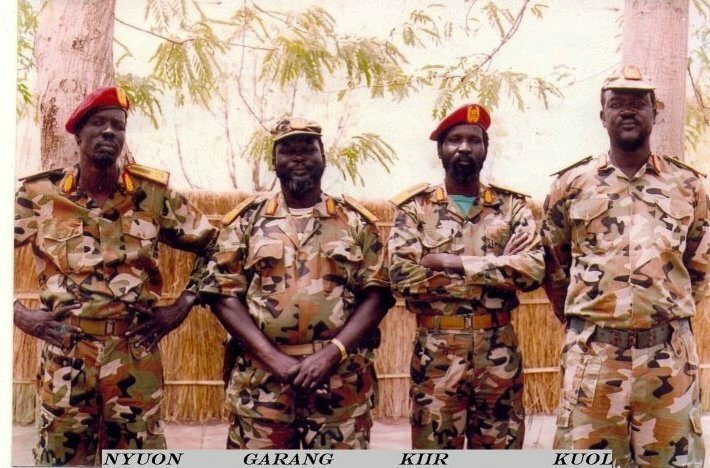 Our method has worked and is working and that is why the NIF regime is always angry with us and not with the self-appointed saviours of Southern Sudan, since such convoluted salvation is through the enemy. Somebody yesterday quoted Dr. Francis Deng that “what is left unsaid is what divides”. Let us be sincere about this issue. The main problem confronting us was not that of structures of the Movement. Ayendit and her delegation did not travel to Yei because of structures; they went to Yei because of rumours surrounding the dismissal and arrest of Cdr. Salva Kiir and a possible split in the Movement as a result of this. It is the same with the three communities in Yei and all those who traveled to Yei (Kuol Manyang and Deng Alor, Riek Machar’s group and others concerned). They went to Yei because of the situation created by rumours. People in the liberated areas including our soldiers are concerned and are waiting for good news as to whether there is a split in the Movement or not. This is the same for our people in the Diaspora as well as our adversary. This is the issue I was addressing yesterday in my statement and that is probably why some of you, especially the GMC members, felt that my response was not sufficient. I did not address the issue of structures sufficiently because, although it is a problem, it is not what caused the situation in Yei. The connection between the commotion that occurred in Yei would be logical only if the rumours were created so that the issue of structures in the Movement are addressed. Of course you all know here that this is not the case. I think Cdr. Santo Ayang and others pointed this out yesterday in their own way. The first problem that we need to dispose of therefore is that of the commotion that was created in Yei as a result of the rumours surrounding the dismissal, replacement and arrest of Cdr. Salva Kiir. Let us not put this under the rug by letting it be overshadowed by the issue of structures. Let us satisfy ourselves that these rumours were not true and dismiss them sincerely. I believe that from my part I addressed this issue of rumours and the associated commotion or misunderstanding sufficiently yesterday and I was sincere about. Some people have asked yesterday for a committee to establish the facts. This is okay, but there would be no need for this if we are all satisfied that there was no such a thing, and in that case what we would need to address is how to address such rumours in the future so that they do not cause similar situations as almost happened in Yei, because the enemy will continue to devise more stratagems to divide us. Some people like Kosti Manibe talked about some of the remedies to avoid creation of such situations in the future. As I said yesterday, our people everywhere are concerned about the rumours and commotion created in Yei. If we are satisfied, as I believe we all are, that this problem of rumours about the dismissal, replacement and arrest of Cdr. Salva Kiir and the resulting commotion in Yei has been resolved then it is important and urgent that we move among our people and units to assure them that there was not such a thing, because that is what people are waiting to hear. Let us also tell our Diaspora and the international community, and this can best be done by holding an international press conference either here in Rumbek or in Nairobi with the four of us. B. The Second Problem: Trust and Confidence. The second issue I talked about yesterday was trust and confidence between me and Cdr. Salva Kiir. I considered this to be the second important issue after the rumours, because as some one put it, existence of a confidence gap provided fertile soil for the rumours to germinate. I talked at length about our long relationship since the Sudanese army and since 1983 and as recently as my visit to Akon in May 2003 and the sacrifice that was made at the Chiefs Conference in New Site, and so on. I think I addressed this issue sufficiently yesterday, except may be for one issue that of personal contact. When I first came from the long trip abroad, I informed Cdr. Salva that I had arrived back and that I was visiting the Region (Eritrea, Ethiopia, Uganda and Kenya). Cdr. Salva wrote to me welcoming me and informing all units that Comrade Chairman had returned back and is resuming his normal duties – a clear indication that he was acting in my absence, and so again it is not true that Cdr. Salva Kiir does not act in my absence, this is automatic; when the head leaves the deputy acts and there is normally no message sent to all units or departments every time the head leaves. On the issue of telephone contacts, we had a similar impression as Cdr. Salva. One of my HQ officers, Major Amat Malual, had difficulty going through to the telephone of Cdr. Salva Kiir. I was actually forced to go through Cdr. Malong Awan – I asked Cdr. Malong Awan twice to tell Cdr. Salva Kiir that I wanted to talk to him by phone and that I was not going through to him. I was finally able to talk on the phone by arrangement with Cdr. Oyay Deng Ajak. Obviously we need to improve our communications, including having a hotline as someone suggested. The issues of a Kitchen Cabinet and some people having bought houses abroad are issues that better communications will solve because I obviously don’t have them. The rents of the four of us here are being paid for by a friendly Government and I don’t believe any of the four of us has a house anywhere, although there are such rumours. For those who might have houses they will talk for themselves. There are other issues of concern that were raise by Cdr. Salva on the question of trust and confidence that I should have addressed and touched on this morning by Dr. Justin Yac. One is that Dr. John does not forgive those who have quarreled with him. First I want to say that I do not consider that there has been a quarrel between me and Cdr. Salva. The commotion in Yei was not caused by a quarrel between the two of us, but by rumours which we are now sorting out. Secondly, it is not true that I do not forgive people. The five members of the first leadership who died were not because I did not forgive them. William Nyuon had come back to the Movement under complete reconciliation, we know how he died. The same thing for Kerubino. Joseph Oduho also did not die on our side. Arok Thon died in a plane crush on the Government side. It is Majier whose circumstances of death are not clear. But in the peace talks we made it clear that we are for a South African type truth and reconciliation commission. As to those of Dr. Riek Machar we are already together as you can see him sitting near me. If anything I am criticized for too much reconciliation and too much forgiveness by even some of you in this hall. So that I do not forgive is untrue. I am very forgiving and will continue to be. The second issue that Cdr. Salva raised was guarantees for those who went public on the Internet and who appeared to support the rumours and commotion in Yei. Again, I want to say that whereas there are those abroad who are writing all sorts of things, this really should not affect us here in the Movement. We are one and there is no issue of victimization of anybody, as we have understood and satisfied each other regarding the last events in Yei. These are the assurances we were giving yesterday, and I want to repeat that the issue of victimization of any sort does not arise at all; it will never happen and all those in this hall and Almighty God above are my witnesses. So, to use Dr. Justin’s story, the concerns of Aguek Atem have no basis at all. Let us unite more than at any other time before and move forward together. I do not have much else to add on the issue of trust and confidence, except to say that trust and confidence are a form of social capital that people build over time – It is personal and there is very little you here can do about it. However, from my part I want to assure you that I will work tirelessly to invest in trust and confidence between me and Cdr. Salva. I agree that I did not address it sufficiently yesterday because I did not think it was the main problem. It is not what caused the commotion or near-explosive situation in Yei. This is not to say that the issue of structures is not a problem. The issue of structures is not new. Second there is no argument that our structures are perfect, and there is nobody who is refusing that we reform our structures. It is therefore a misrepresentation of the situation for anybody to suggest that the chairman did not reply the points of Cdr. Salva because the points regarding structures are not his. These are our collective problem and our collective responsibility. The issue of suitable structures for a liberation struggle is not easy and all of us have experimented with several structures since 1983. It was not the Chairman alone, but all of us collectively in the Leadership, whether this is the PMHC, the NLC/NEC or the SPLM-LC. We used unorthodox means because of the unorthodox situation we are in. Even the position of the COGS that somebody talked about before as being held by the Deputy Chairman is not the traditional organizational form. This issue came up in the 1994 NC and my guidance was that let us not be catholic about this issue and that remains my position till today. The structures that we adopted at various times were dictated by changing situations and all of us participated in those changes and in the evolution of those structures. Of course I am aware that often the credit goes to all and the blame goes to one in person, the Leader of any organization. In 1999 for example we all participated in the resolution passed by the NLC to restructure the Movement; this was not my decision alone. We were simply trying to solve pressing problems to survive. The SPLM-LC was actually a compromise as some officers were calling for a return to military rule. Concerning assignments, these have sometimes been dictated by situations, like when Cdr. Salva Kiir was assigned as a Front Commander for BGR while he was Deputy Chairman and COGS. This was to solve a particular situation in the Region. This is the same for other similar unorthodox assignments to solve similar situations. These measures may now look wrong in hindsight, but this is how we got to where we are. Also the problem of a SPLA GHQ has always been with us. The GHQ has actually been there and is there now in Yei, but there are problems that we know which are associated with its functioning. We need to solve these problems so that the GHQ functions normally. The D/COGS at times had field assignments but this happens in many guerrilla situations and does not prevent the functioning of guerrilla GHQ. We can have them at the GHQ and still we would have the same problems as we have in their absence. Cdr. Peter Wal Athiu has since returned to GHQ and there is no noticeable improvement. Now as move towards the peace agreement, we need to complete GHQ establishment and have the COGS and his deputies and other staffs in one place to organize the GHQ and the army. In the SPLA Act, that has been signed into law, the COGS has wide ranging powers which are organic to that office, the issue is using them and improving on the job description. Finally, the issue of structures in the transition was actually addressed by a large group of more than 150 cadres, and we discussed the issue of transition in the SPLM-LC. The result was presented to me in a document entitled (______). I made some corrections and it is now under printing and will be presented by the Economic Commission to the LC. These can be immediately formed and start working to effect the transition leading into Interim Period and formation of the GOSS. Each of them would be under each of the three Vice-Chairmen and all supervised by the Chairman, and all working in one place as a collective leadership (SPLM-LC and Executive) managing the transition. This is a good document in my view. The only thing that might need reconsideration in the document is ISCOORT, so that it simply becomes a Secretariat of the SPLM-LC facilitating its work. What we may add is expediting of holding of the NC.